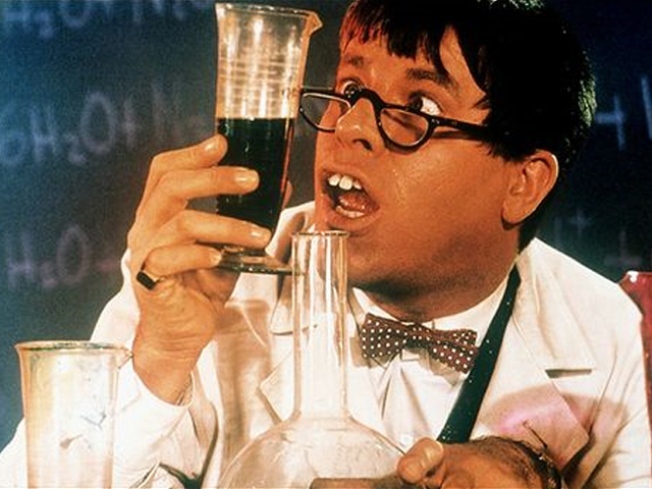 Jerry Lewis in "The Nutty Professor" -- or as the French call it, "Docteur Jerry et Mr. Love". Confession: We know a lot of French people, and not a one has ever got ripped on burgundy and started frothing about his or her love for Jerry Lewis like they’re all supposed to. That said, it’s true that a passel of arty French film institutions and publications (Les Cahiers du Cinéma, Positif) have lauded Lewis’ rubberfaced oeuvre over the years, and he’s received France’s highest order, the Légion d’honneur (then again, so have Sharon Stone and Celine Dion). So when Anthology Film Archives announced that they were organizing a festival – which kicks off today -- to address “one of the questions that has challenged thinkers throughout the ages: could the French have gotten Jerry Lewis right?”, we kept a straight face, and so should you. Jerry Lewis is about to receive perhaps the most eloquent advocacy he’s received on his own shores for decades, in the form of a new book on his work by Chris Fujiwara (critic for the BOSTON PHOENIX, editor of UNDERCURRENT, and previously the author of the definitive studies of both Jacques Tourneur and Otto Preminger). To celebrate its publication (by the University of Illinois Press), we’re presenting a rare opportunity to see the majority of the films Lewis directed himself, several of them unscreened in New York for over a decade. Could a David Hasselhoff retrospective sponsored by the German Consulate be far behind?